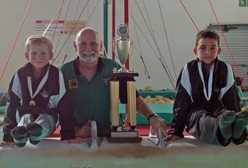 Well done to Luke James and Taine Meumann who recently did the club proud by winning medals at the National Gymnastics Games. The National Gymnastics Games was held in Pretoria during the first week of October. Luke competed in Level 4 & won a gold medal for his Rings routine, and Taine placed second on Floor & 3rd on Rings in Level 7.
as a National Board member as well as winning the administrator of the year trophy.